Louis at 15, with his mother and sister. ​change the music of America? TO A BLACK CHILD SCRAPING BY AMONG SHOOTINGS AND STABBINGS, street hookers and pimps, and bottom-line squalor, a good home could mean life over death. But in his childhood years—around 1905 to 1915--Louis “Dipper” Armstrong found little family support. His beloved young mother Mayann was hardly around, on the streets herself, scratching for a living. His father had abandoned the family. Louis and his sister had to scavenge food from garbage bins. Chevra Thilim Synagogue, New Orleans, 1915. Congregants included the Karnofsky family. But another family may have turned the tide. 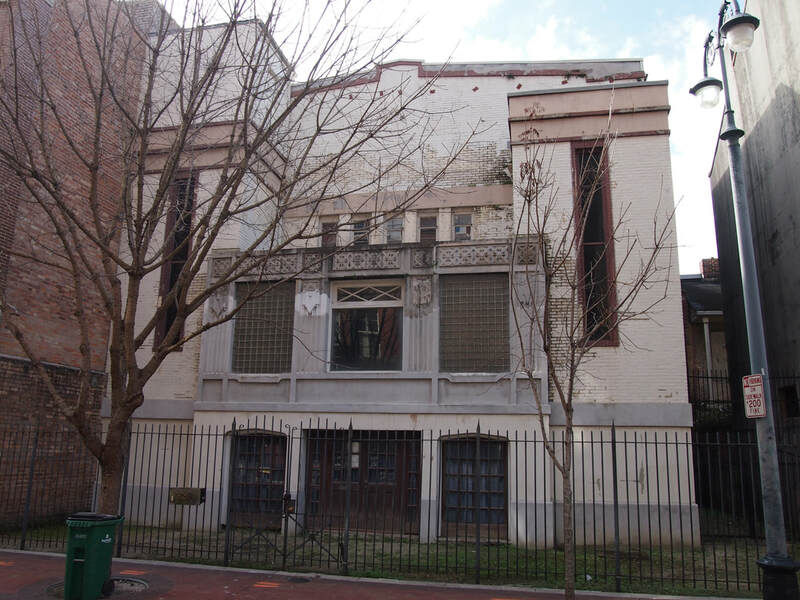 The Karnofskys, a poor but gritty clan of Lithuanian Jewish immigrants, had put down roots near Girod and Franklin Streets, a few blocks from the Armstrongs’ dwelling. When Louis was just seven years old, the Karnofskys brought him in—along with other young blacks—to help with their budding coal and junk businesses. ​At the time, Jews nurtured a kinship with blacks, the "comradeship of excluded peoples." But the Karnofskys went a step further: they treated Dipper as family and supported his musical talent, giving him structure—and a sense of self. He worked with them for years and never forgot them. "It was the Karnofskys…who nurtured the spirit of a kid from a broken family, a broken life, and transformed it into a cornucopia.” --Randy Fertel, Ph.D., whose turn-of-century Jewish family owned businesses just blocks from Chevra Thilim. IN THIS JOURNEY BACK TO OLD NEW ORLEANS, we’ll cover the Karnofskys’ escape from Eastern European pogroms and their arrival in Louis’ neighborhood. We’ll see the racism pummeling both Jews and blacks, and how the Karnofskys helped their brood (Louis included) to fight through and rise above. We’ll see how, working for the Ks, a pre-teen Louis learned the value of hard work, which would shape his career. Louis dead-end neighborhood--Perdido Street, New Orleans, turn of century. King Oliver's Creole Jazz Band, 1923, Louis kneeling on slide trumpet. This is the breakout band that brought Armstrong out of the New Orleans swamp to Chicago. Most Crescent City musicians then held down day jobs--as factory workers, plasterers, cigar makers, coal cart drivers, and in other "street trades." Louis was no exception.This performance dramatizes the labor of their days, together with the joy and triumph they felt as the sun went down.